Bristol 2014: PMC expands range with twenty.26 speakers | What Hi-Fi? 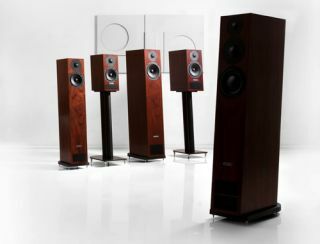 We're huge fans of PMC's twenty series loudspeaker range and at this year's Bristol Sound and Vision Show, PMC has announced the arrival of the twenty.26 – the latest addition to the range and what the company describes as the "pinnacle" of the twenty series. We're expecting big things from the twenty.26 after its predecessors, the twenty.22 and twenty.23, both scooped gongs in our 2013 Awards. PMC says the twenty.26 comprises the same characteristics as its sister speakers, but also comes with the "added ability to convey huge dynamic impact and the sheer scale of a musical performance". Sounds good, then. Standing 41.8in tall and 7.5in wide, the twenty.26 has an impedance of 8 Ohms and comes in four finishes. The twenty.26 is the result of months of intensive development work undertaken by the team of engineers at PMC under the leadership of chief designer and company owner Peter Thomas. PMC marketing manager Keith Tonge said: "The already incredibly popular twenty series moves on a step with this new model and I, for one, can’t wait to unleash it." • If you're visiting the Bristol Show this weekend, PMC have a great offer going – purchase a twenty.21 or a twenty.22 at the show, and you'll receive a free pair of Twenty stands worth £300.